Gottfried Helnwein, 2011, "Child Dreams 6," 94.5 x 172"
Seven arresting, large-to-enormous paintings are presented in this solo show (up through February 25, 2012), another in a long line of powerful exhibitions, by painter, photographer, costume and stage designer, and performance artist Gottfried Helnwein (this is the artist’s 15th exhibition at Modernism). Raised in Vienna, Austria, during the troubled years following World War II, Helnwein has focused his career on using art as a means of confrontation: “I felt I could strike back with my pictures and force people to look at things they’d rather forget,” he says in an essay by Robert Flynn Johnson. In this strategy—though less direct—of creating unforgettable politically and socially critical work—and specifically regarding the connection of focusing on the Nazis—there are links between Helnwein and Belgian painter Luc Tuymans. A primary focus of the artist, which is the case with this show, is portraying young girls who have been victimized or are otherwise in danger; the mood is foreboding. The photorealistic canvases—Helnwein’s skill is impeccable—of often larger-than-life subjects make the impact all the more intense. And while his images are often disturbing—his work has been vandalized more than once over the years—they are never repulsive; the works balance horror with beauty, providing a successful vehicle that plays straight to the artist’s intent: we stop and look and think about it. This current exhibition, featuring work from a new body of work, “The Dreams,” was inspired by the sets and costumes Helnwein created for “The Child Dreams,” a play by the late Israeli playwright Hanoch Levin. Several of the works feature girls (or a girl) wrapped in white bandages and wearing a flowing white dress, floating/falling through an undefined red/black space; the dreaminess, mysteriousness, of the works is a departure from the past, but no less enthralling. 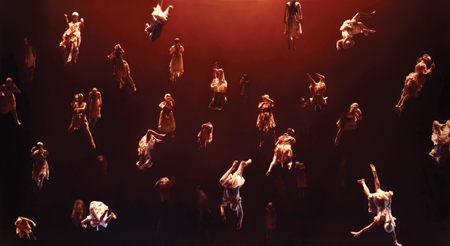 The most captivating of these is the huge (94 1/2 x 172 inches) The Child Dreams 6(2011), which features over twenty of the girl figures, lit from above and center by an unknown source, in various poses and at varying degrees depth—some almost fade away, appearing as ghostly beings retreating into the darkness, while others are well defined. The work evokes both a fear of helplessly falling into the abyss, which is compounded by a fear of violence, implicated by the bandages, as well as poetic freedom, as the figures almost blissfully move through space, ballerina-like. Once again, Helnwein has us just where he wants us.